MAY PEACE AND JOY SURROUND YOU AND YOUR FAMILY THIS CHRISTMAS AS WE CELEBRATE THE BIRTH OF OUR LORD AND SAVIOR. BLESSINGS FROM BRIGHTHOPE KENNELS. VICKI AND DAVE. CIRON, DAPPER, ALLURE, ECLAT, ARINE AND THE GOLDEN GIRLS, DOROTHY, BLANCHE & ROSE. 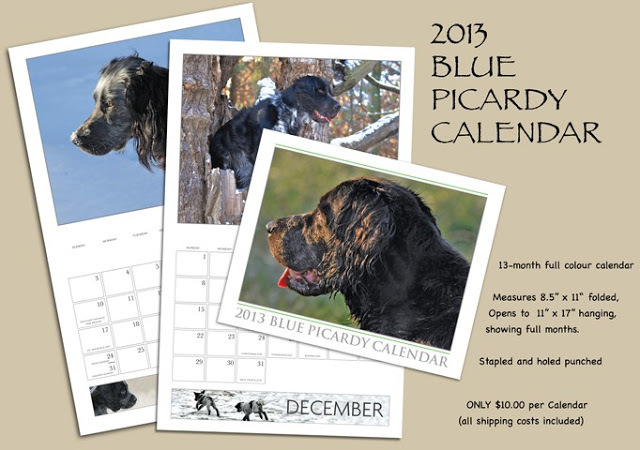 Once again the beautiful Blue Picardy Spaniel is being showcased in a calendar. Many thanks to Kim & Pat and Susan & Kypros for all the hard work that goes into the production. Every now and then someone will send a picture of their Blue and we are realizing that there are a few more around the world then what we thought. So this years calendar is truly international. One thing is for sure, owners love their Blues. Puppies love exploring outdoors and love their playtime. The 2013 Blue Picardy Calendars are ready to go; This is a full colour, 13-month calendar full of lovely blues from the US, Turkey, Holland, Canada and even some from our own Brighthope! At only $10.00 CDN (price incudes shipping), these calendars are sure to please everyone on your holiday list! Currently, PayPal is the payment method of choice (and the fastest way to get your calendar). Please contact Susan Varga at zoeandcoullah@gmail.com if you would like to pay by cheque. Calendars include US and Canadian holidays and measure 11" x 17" when open and hanging. We can always count on our lovely granddaughter Katelyn to gather up some of her friends and bring them out to Nana and Papa's house for some puppy socialization time. 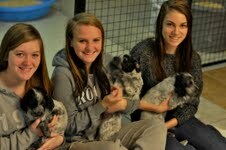 The puppies loved every minute of the attention they got and I am sure Katelyn and her friends loved the puppy cuddles as well. 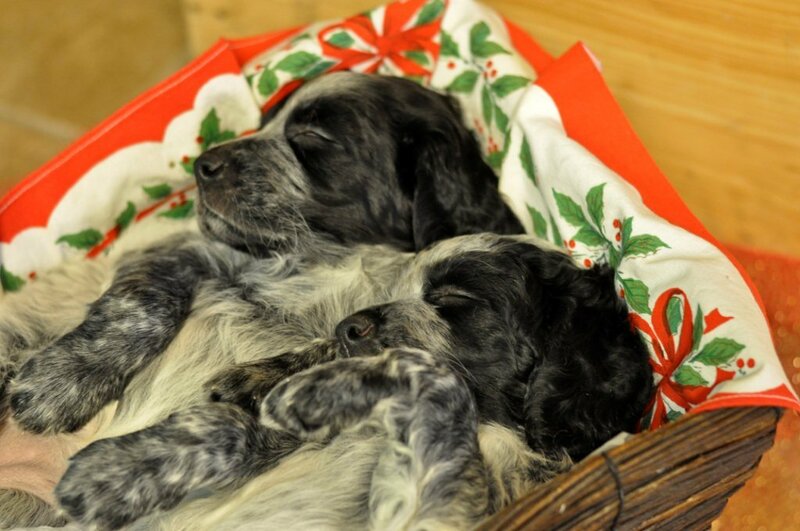 The puppies were tired out after playing and we thought we could get some nice Christmas photos of them in the little sleigh. 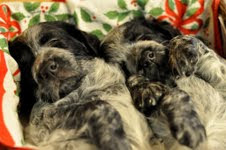 I guess they had enough and couldn't stay awake and they are also bigger then what I thought so we could only fit two in the sleigh. These photos were taken by another lovely girl in our family, our oldest daughter Laurie (Purple Lavendar Photography). It does look like this puppy was targeted in a food fight.... but this is how she looked when her head finally came out of her breakfast bowl this morning. Puppies have now moved to the big puppy pen. They had lots of visitors today and have met all the other Brighthope Blues as well.